A 2015 report from Snohomish County, King County and the Tulalip Tribes outlines protection strategies for salmon and salmon habitat within the Snohomish Basin. 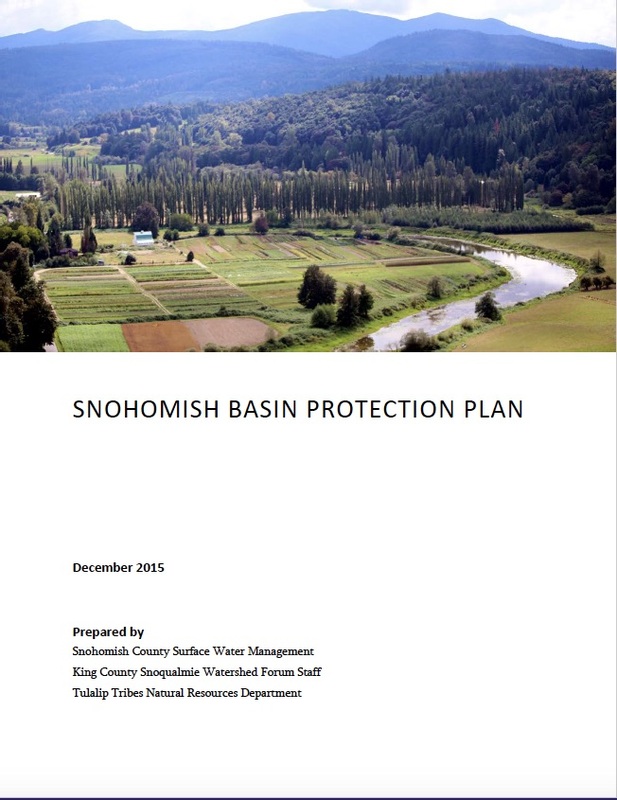 The primary goal of this 2015 Snohomish Basin Protection Plan (SBPP) is to identify protection strategies that prevent the degradation of hydrologic processes that support salmon or salmon habitat. In 2005, the Snohomish Basin Salmon Recovery Forum members approved the Snohomish Basin Salmon Conservation Plan and laid out a 50-year road map for multispecies recovery. The 2005 Plan was based on historical records, the best available science, and social and economic conditions. The Plan recognized that it was critical to use adaptive management to increase the chance of success by incorporating new data, information about successes and failures, and new opportunities provided by changing context in the Snohomish River Basin. Since 2005, there have been many site-scale successes on restoration projects in the mainstems, estuaries and tributaries. However, many environmental indicators continue to decline, according to local data and the 2009 State of the Sound report (Puget Sound Partnership 2010). The continued decline is likely due to little-understood cumulative effects that need to be addressed through protection at the landscape-scale. The Snohomish River Basin contains diverse aquatic resources, a variety of fish and wildlife populations of local and regional significance, and a diverse portfolio of land uses. The Basin and its many natural resources and human communities are inextricably linked to how water moves through space and time, from the smallest headwater streams to mainstem rivers and the groundwater beneath the surface. Hydrology in the Snohomish, Snoqualmie, and Skykomish rivers and associated tributaries is changing. Historical flow patterns and volumes are shifting as a result of changing land uses and climate change. Human activities—such as impervious surface installation, tree cover removal, traditional stormwater conveyance systems, and water withdrawals—are contributing to altered watershed processes, degraded water quality, loss of wetlands and riparian forests, and degraded shoreline conditions. The continued degradation of hydrology in the Basin, rapid urbanization, and threats from climate change motivated a new effort focused on the protection of the water resources in the Basin and the watershed processes that support them. This SBPP identifies areas that are important to the goal of protecting hydrology, and examines new and existing tools to help support that goal. Through the protection of hydrology, the SBPP aims to ultimately protect habitat quality, quantity, and heterogeneity for fish and wildlife. The protection of hydrology will also support a continued high quality of life for those who live and work in the Basin, help ameliorate flood risks, and ensure the availability of water for multiple uses into the future. To best characterize the different challenges, hydrological importance, and opportunities in each area, an approach was developed that incorporates information on land use, expected climate change impacts, services provided by hydrology, salmon use, existing protection measures, and possible improvements to policies, programs, and projects. The Puget Sound Watershed Characterization model was used to understand the importance of different components of hydrology at various scales and to describe the level of hydrological degradation. Assessment of the components of hydrology resulted in the development of basic protection strategies and aided in the assessment of tools to achieve protective actions. The intent of the SBPP is to set a framework for a more complete implementation and accounting of protection efforts by all Basin partners. Section 1 of the SBPP provides the Basin protection context and more details on the intended purposes of this document. Section 2 describes the technical assessment approach and Section 3 summarizes the results of the technical assessment (with additional details provided in Appendix A). Section 4 of the SBPP provides an overview of protection tools that can be a starting point for planners and others to consider in combination with local hydrology concerns, land use types, fish use, and implementation opportunities. The tools include a range of existing programs in their current form, existing programs with suggestions for improvements, and entirely new tools. Section 5 presents an assessment of current and potential future funding strategies to support SBPP objectives. Section 6 presents a summary example of how the SBPP can guide the development of protection strategies towards a specific program goal—in this case, salmon recovery—and provides updates on information developed since the 2005 Snohomish Basin Salmon Conservation Plan. Appendix B provides more detailed recommendations for updated salmon recovery protection strategies relative to specific land uses in the Basin. In December 2015, the Snohomish Basin Salmon Recovery Forum adopted Appendix B as the first formal adaptive management action for the 2005 Plan. This protection update does not change existing restoration recommendations and habitat goals from the 2005 Plan. Snohomish County Surface Water Management, King County Snoqualmie Watershed Forum Staff, and Tulalip Tribes Natural Resources Department, 2015. Snohomish Basin Protection Plan. Snohomish Basin Salmon Recovery Forum. Everett, WA.